WHO SAID ALL BAGS ARE EXPENSIVE? THEY LIED! You know I love quality things I am a true believer that somethings you shouldn't cut corners on. If you choose the generic milk in walmart over the brand one I'm not upset but bags to me say a LOT they can make a simple outfit hot and the best accessory ever If you ask me. I am the owner of some high end bags but why pay more when you can have a great bag for less. For the past week I went out to find the hottest summer bags UNDER $40.00 now this is no easy task. I refused to go for a bag that would break in less then a month of wear. I recently visited tj maxx and came across a HUGE collection of Michael Kors bags none of which was under $40 dollars but was well under the suggested retail price. I am a fan of animal print but i can't wear to much of it so when i spotted this steve madden bag I had to get it....I even looked for another one to gift to someone to avail :(. This bag retailed for $100 dollars and I got it for $35.00! The inside is purple which I loved because I know i'm the only person whose make up most of the time eyeshadow has gotten loose in their bag and made the biggest stain ever......so the purple was kind of hot and conveinent. the strip is thick and wide enough to even wear on my arm if I wanted which I don't really prefer to. 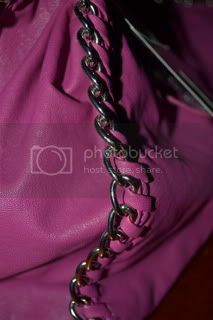 This hot pink bag was just the cutest I fell in love with the color I love pink! The metal detail along the rim was the cutest as well. Summer allows you to wear colors like this and get away with it. This bag can make the simplest outfit POP! I'm wondering exactly what I'm going to wear it with but in due time I know I will come up with something. The suggested retail price was $85 I got it for $25 dollars! 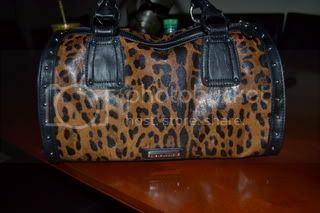 so my goal is acheived you don't have to wear the most expensive bag it just has to make a major statement! why thanks a bunches I hope that you keep coming back and If you haven't followed by now what are u waiting for?